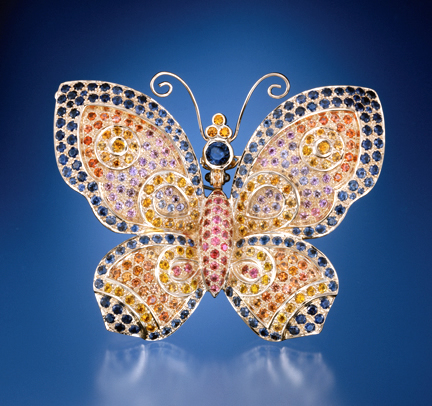 This magnificent scintillating butterfly of Montana Sapphire demonstrates their amazing quality and range of color. A collaboration by designer Paula Crevoshay and gem dealer Robert Kane of Fine Gems International, it will make an important addition to the National Gem Collection at the Smithsonian. The rare and little known sapphires in this treasure will delight and educate both visitors to the museum and scholars alike for generations to come. This fabulous jewel includes 333 sapphires weighing 27.97 carats and 98.48 grams of 18K gold. As is typical in Crevoshay jewels, the back is as carefully designed and wrought as the front. 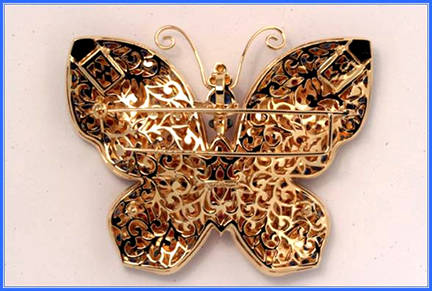 The Butterfly can be worn as a brooch or as a pendant. It has boxes attached so that it can be incorporated into an elaborate neckpiece or strung with beads as well.